Four new playable characters have been added to the Jump Force roster, and an early 2019 release window has been announced. At TGS 2018, Bandai Namco dropped a brand new trailer for their upcoming fighting game, Jump Force, while also sharing exciting new details about the game including a release window, Collector’s Edition, and Season Pass content. First up, four new playable characters have been added to the Jump Force roster including Yusuke and Toguro from Yu Yu Hakusho, and Kurapika and Killua from Hunter x Hunter. You can get a feel for how these characters work in battle by watching the latest Jump Force trailer shown at TGS 2018. Itching to dive into Jump Force as soon as possible? According to Bandai Namco, Jump Force will release in February of 2019. Players can pre-order copies of the game, including the Collector’s Edition, starting today. 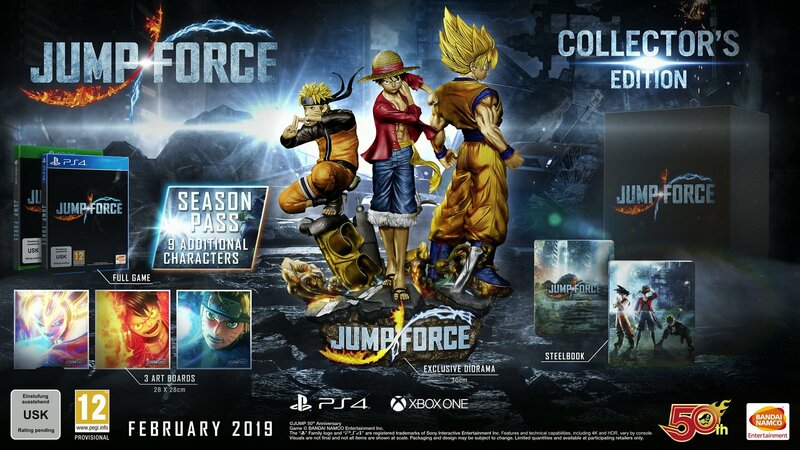 The Jump Force Collector’s Edition can be purchased for $259.99 and includes items like a SteelBook case, 3 art boards, and a 30cm diorama of Luffy, Naruto, and Goku. Additionally, the Collector’s Edition will include the Season Pass. As with other Bandai Namco titles, the Season Pass can likely be purchased separately if you’re not interested in spending extra on special editions of the game. While optional, Season Pass owners will reportedly gain access to nine additional DLC characters, which is definitely enticing. Jump Force will also feature four original character designs from famed Japanese manga artist, Akira Toriyama. These designs were showcased in a separate trailer, which we’ve embedded down below. Last, but certainly not least, you can register for the game’s upcoming closed beta right now. We’ve put together a quick guide on how to participate in the Jump Force beta, with beta signups ending on October 7. The closed beta is set to go live starting on October 12, so be sure to register now in order to secure your spot. With that done, let us know down in the comments below what you think of Jump Force. Is it a game you’re planning to pre-order, or would you rather wait until reviews come out before purchasing? Jump Force is scheduled to release in February 2019 for Xbox One, PlayStation 4, and Windows PC. For more on Jump Force, be sure to check out some of our previous coverage including how you can create custom character in Jump Force, the full Jump Force character roster, and the addition of Yugi Muto to Jump Force.